Her first passport photo, taken at five days old. While she was in the womb, Luna and Momma went together to Taipei and New York and Washington and Bangkok and London (twice) and Okinawa and Tokyo (seven times) and tagged along with the former POTUS to Laos and Hawaii. We are confident she will be a curious explorer, just like her sisters. But she needs a passport and an official certificate from the State Department noting that she’s a U.S. citizen born abroad. 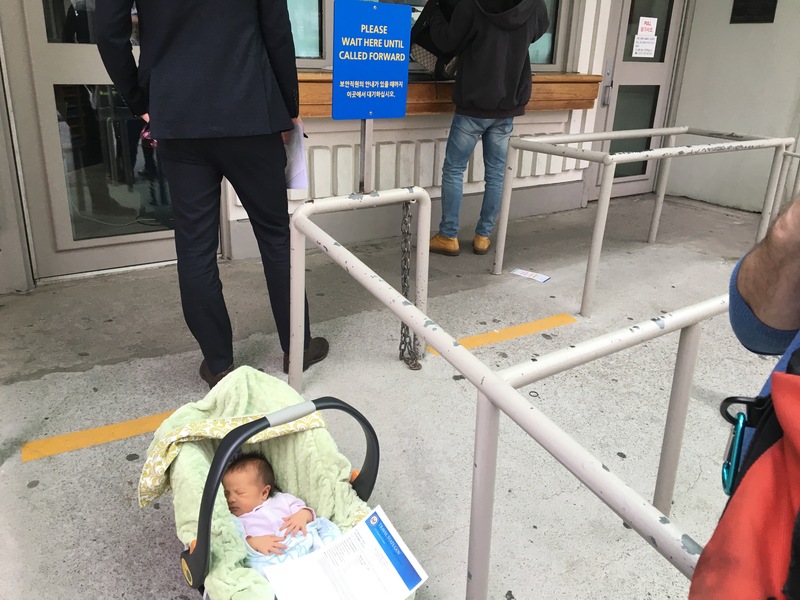 So this morning Luna had an appointment at the U.S. Embassy in Seoul to apply for her birth certificate, passport and social security card all in one trip. The passport and birth record should come in two weeks, the social security card takes awhile longer. A productive day for the little one! In line for her passport appointment. Posted in Events & Activities, MilestonesTagged birth certificate, citizenship, passport, social security, U.S. EmbassyBookmark the permalink.